"Every day to go to school is happy"
Located about 400km from Hanoi, in Xin Man District (Ha Giang Province), Che La is a small village where the H'mong and Nung peoples live from generation to generation. Having a volunteer trip to Che La in 2012 to support for poorest families, the locals still endures difficulties from nature disasters as well as lack of facilities after 2 year. It is the reason why we decided to return for second time to help children for new school year. In Che District, there are currently an elementary school and 8 small mountainous schools set up. 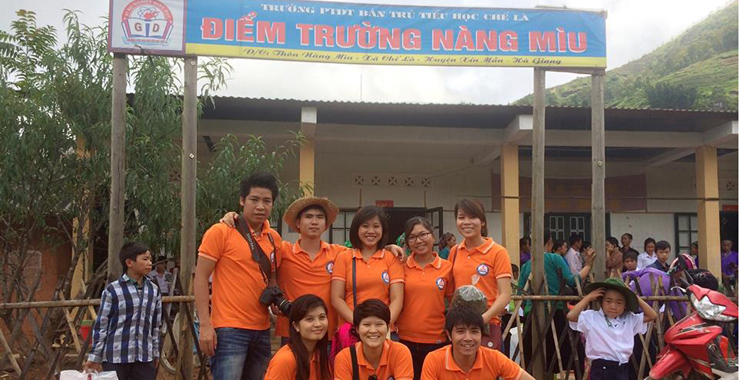 Our team chose Nang Miu (Coc Dong) school for this humanitarian mission. After a call for support, we collected many school supplies: 67 new uniforms (blue trousers and white camouflage, 261 notebooks, 30 school bags, 37 hats, hundreds of pens and books). In addition, 16 new clothes and milk cartons are prepared for nursery students. The day of departure has finally arrived. By 6 in the morning, 9 members of Asian Travel gathered to bring large cartons to a minibus. Everyone was ready for a long meaningful trip. During the trip, we sang to prepare the show as a small gift for children. After driving nearly 400 km on the beautiful mountain roads, we finally got to the village. We were greeted by the primary school teachers and pupils and enjoyed dinner with the local dishes giving us a good impression. Listening stories of teachers, we were really impressed with their devotion and their sensitivity to the students as well as student’s difficulties. We got up early to feel the fresh morning atmosphere and watch the kids who go to school. Big packages were moved to the small school of Nang Miu (Coc Dong). The dirty road leading to the school is very narrow and full of gravels. Because of the rain, this road is muddy and so slippery. We came to school at 8:00 and offered gifts to children. Our tiredness disappeared when we saw the smiles on the children's faces. The white color of new clothes blends with the green color of forests. It seems that happiness is covered everywhere. After noon, we organized group games: dance "Chicken dance", football and other activities. After dinner, a show is specially designed for children. Beautiful songs echo throughout mountains. Fatigue after a long day had gone away, only happiness fills our hearts. We returned to Hanoi with a lot of memory. That moment will be imprinted in our memory forever. We continue to make longer-term humanitarian missions to bring happiness and hope to all children. Thanks to Che La school teachers for their kindness. - Ms. Alice Quarneti - from Casola Valsenio (RA), trip to Vietnam and Cambodia from 12/08 to 23/08.